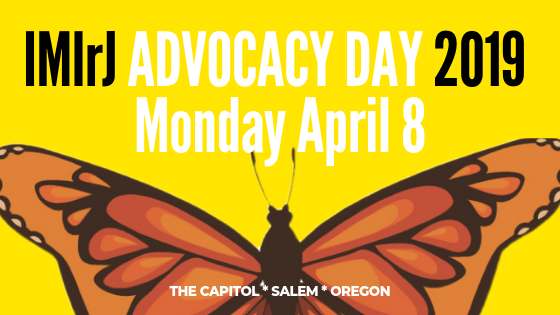 Join people of faith from across the state on Monday, April 8th for IMIrJ’s first-ever Advocacy Day in Salem! Drawing on the rich practices, stories and rituals of our various faith traditions, we’ll join our voices together in a meaningful – and politically impactful – day at the Capitol, amplifying the demands and priorities of Oregon’s immigrant and refugee communities. At the same time, we know that passing state policies that will allow Oregonians to live in safe and welcoming communities regardless of their immigration status is more than a one-day affair. We are committed to accompanying your faith community’s Sanctuary Team leading up to and beyond April 8th, as we work together to ensure true Sanctuary for All. NEW! We will be offering a Family & Children track, as well as special accompaniment and opportunities for youth who choose to join us for the day. Learn more here. Please Register by Monday, April 1st.